More doing, less blogging. The busy summer days have kept me plenty occupied, and I apologize for the brief break in my blogging. I hope you've been enjoying summer, too, and haven't missed my posts too much! One of our goals this summer is to spend as much time outside as possible enjoying nature. Did you know that July is National Recreation and Parks Month? At the end of the school year, my daughter's teacher gave her a parks passport, challenging her to visit the local parks over the summer. It has helped motivate us to get outside and do some exploring. During our visits to the parks, we also discovered that many of the parks have hidden treasures called geocaches! Be warned, geocaching is a rather addictive family pastime! Geocaching, a high-tech outdoor treasure hunt, involves locating hidden caches in parks and other areas using GPS coordinates. To see if there are any caches hidden in your area and learn more, visit http://www.geocaching.com. I imagine that, like us, you'll find the number and proximity of the geocaches near you surprising. Some caches are easier to find than others, and the locations and containers vary as well. 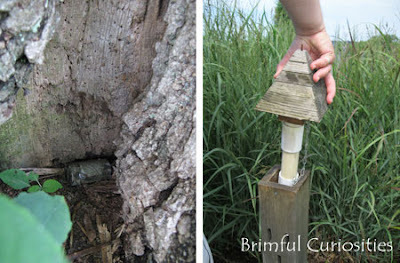 We found one cache hidden inside a clever structure that looked like a wooden birdhouse. So far in our searches we've found various trinkets and toys inside the caches, along with the logbooks that you sign upon discovery. 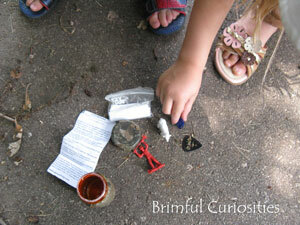 My kids like to trade treasures and swap out the items in the cache. We also made a great find this weekend -- a travel bug! 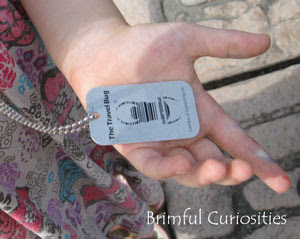 Travel bugs are items stamped with a special trackable code. You can log into the Geocaching tracking website to log the code and view the travel map of the item. The travel bug we discovered started out its journey in Hawaii. Most of the geocaches are kid friendly, though some are more so than others. The Dinosaur Train Themed Geocaching Challenge is one specifically designed with kids in mind, especially fans of this popular PBS children's show. Each Dinosaur Train geocache features a dinosaur from the online Dinosaur Train Field Guide and includes educational materials about the dinosaur. Dr. Scott from Dinosaur Train always encourages young viewers to: "Get outside, get into nature and make your own discoveries!" Geocaching is a perfect way to do just that. Check the Dinosaur Train Geocache list to find locations near you. If your family is up for even more of a challenge, create and hide your own Dinosaur Train Geocache. [pdf directions] By the way, fans of the show will be glad to know a new season of Dinosaur Train begins soon. “Dinosaur Big City” premieres August 22 on PBS Kids. Time to score a special treasure of your own! 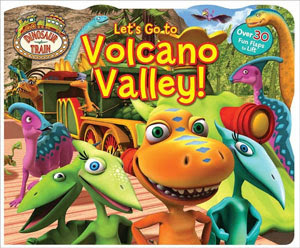 The Jim Henson Company has kindly offered to give away a copy of the new Dinosaur Train Lift the Flap board book, Let's Go to Volcano Valley! from Reader’s Digest. Lift the flap books are almost like geocaching -- fun to explore and you never know what you'll discover! For a chance to win, leave a comment relative to this post or answer the following question: If you made your own Dinosaur Train geocache, what actual dinosaur would you feature [need help? - plenty of ideas at the Dinosaur Train Field Guide]? • Contest ends on Monday, August 1st, 2011 at 11:59 PM CST. We love Dinosaur Train! I think we would hide a triceratops, like Tank. We love Dinosaur Train too! I am very intrigued by geocoding. I've heard about it for a couple of years, but I'm still not sure how it works. I guess I'll have to do some research. I tweeted about this giveaway and have been following you for a few months now via @JennLikesIt. In keeping with the family on Dinosaur Train it would use a dinosaur who flyes maybe a Rhamphorhynchus. I would feature a Amargasaurus. My boys love the Brachiosaurus! We have to try geocaching too one of these days. As to the dinosaur, I am sure it would have been Buddy for us - Anna loves all things T-Rex. Our family loves geocaching! And I will have to look up the Dinosaur Train one because my kids like that show as well. Thanks for letting us know about it! We haven't gotten into geocaching (although I've heard of travel bugs and think they're awesome). We're letter-boxing folks ourselves. :) We particularly like to collect stamps in our book from boxes while we're on vacation. Aren't these types of activities great?! So cool! It would have to be T-Rex or Velociraptor. geocaching is pretty popular. Sounds like fun. I don't have a GPS so might be little hard to participate. What a fun activity! I think it would be fun to feature a Spinosaurus! I've always had an affection for Stegosaurus so that's what I would feature.